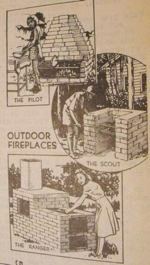 Home / Garden Projects / Outdoor and Garden Miscellaneous Woodworking Plans for Projects / 3 Outdoor Fireplaces Vintage Woodworking Plan. 3 Outdoor Fireplaces Vintage Woodworking Plan. R-ANH0811 - 3 Outdoor Fireplaces Vintage Woodworking Plan. The Scout: This simple fireplace serves every cooking need but baking. It is also a good incinerator. It may be built of flat stones, field stones, brick or broken concrete. The Pilot: The model was built of paving brick, which are larger than common fire brick. The working drawing show common brick used, with hearth and fireplace lining of firebrick. The Ranger: Sheet iron stove-top ovens are inexpensive. Those of the model measure 12 inches each way. For a deep oven, remove the back and splice the ovens together. Bonus plan included, pattern No. 430 Built-On Pergola. Condition of this recycled plan: Very good (price as marked). We have a copy of this plan available. Plan printed on one sheets of 17 x 22 inch paper. Patio Party Center Woodworking Plan. This roll-around cart, with its large work surface, is perfect for entertaining family and friends. It would make a great BBQ cart. This is a vintage woodworking plan. Visit our FAQ page for a full definition. The two side slabs of this brick barbecue design provide plenty of work surface and the arched opening above the grill area gives it a distinctive look. This is a vintage plan, we only have a few copies of these available. Kettle Grill Caddy Barbeque Vintage Woodworking Plan. You can convert your kettle grill into a mobile outdoor cooking center. All parts can be cut and assembled from common-size pine lumber using only hand tools. This is a vintage project plan. Barbecue House Vintage Woodworking Plan. Barbeque for Patio or Lawn Vintage Woodworking Plan. Brick Barbecue Vintage Woodworking Plan.